Executive Chef Pisan Torphet has just returned from Europe, taking a brief “post-graduate” course in fine restaurants there. 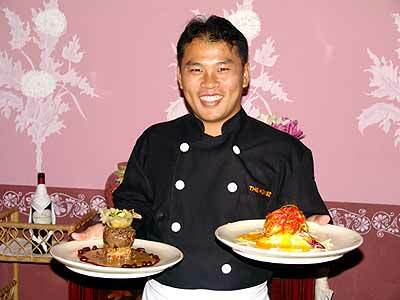 He has taken ideas gleaned abroad and adapted them to a new and exciting menu for The House. You may know how unusual it is for a master chef to continue to seek inspiration outside his own domain, and you will appreciate Chef Pisan all the more when you sample some of the unique and delicious dishes he offers. On a recent pre-flood evening, the Dining Out Team was introduced to the new fare in the elegant restaurant setting by the chef himself. Little did we know how much we would long for this fine food and peaceful, elegant setting in the next few days as the muddy Ping River surrounded us and held all but the heartiest swimmers hostage. We began with an assortment of truly creative appetizers. Smoked salmon on a potato souffl้, topped with lime zested yogurt cream came first. Smoked salmon is always delicious, but the yogurt cream made this one quite special. Next was grilled squid served on baby kale, stuffed with a creamy mousse of prawn and squid caviar, and dressed lightly with lime dressing. This dish was clearly the favorite of several of our diners. My personal favorite arrived - seaweed wrapped crispy tuna served with pineapple salsa and mustard soy vinaigrette. The tuna was cooked rare; the seaweed served as a crisp batter. The salsa provided just the right touch of sweet and sour accompaniment. I simply savored the contrasting colors, textures and tastes. Two delightful newcomer salads arrived at the table, too. Salmon marinated in lemon juice and coconut milk served with apple, jackfruit and green mango salad. We loved it. Then came the seasonal avocado salad with crab and prawn chipotle dressing. This was a true feast. Our appetizers ranged in price from 190 baht to 240 baht. Salads were priced at 220 to 250 baht. The House also features staples such as foie gras served on grilled apple slices with honey balsamic sauce, and Caesar salad served with Gorgonzola croutons. You may be assured of the freshness of all ingredients used at this fine restaurant. Our table was cleared, the white wine glasses removed, and a fine South African red wine was poured. The entrees arrived in spectacular form. The New Zealand beef tenderloin was stacked on pommes Anna and topped with a potato cup filled with saut้ed shitake mushroom and zucchini. Surrounded by kidney beans and a delectable morel sauce, this was an artistic as well as a gourmet feast. The beef was tender, and the sauce rich. A five-spice duck breast served with potato pancakes and red cabbage which was accompanied by a tamarind demi glaze caught our attention. The sweet and sour combination worked quite well. Tamarind, so plentiful in Asia, is a lovely contrast to duck. 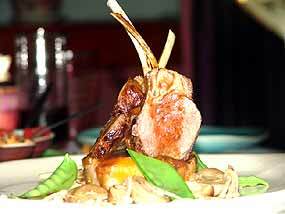 The lamb cutlets were eye-catching as well as tasty. Served with mushrooms and peas, the butternut and taro puree drizzled over the plate was a delightfully new accompaniment. The Dining Out team was amazed by the presentation as well as the completely satisfying taste of the pan friend grouper. Served on asparagus polenta, this delicious fish was accompanied by wok-fried lettuce, young palm hearts and a fennel carrot sauce. Even those among us who are difficult to please conceded this to be a fine dish, no doubt a favorite. The entrees we sampled rang in price from 340 to 790 baht. Our dessert can only be described as ‘Death by Chocolate’. A combination of dark and white chocolate drizzled with raspberry sauce, topped with raspberries and a few sprigs of fresh mint, it was artistic, delicious and completely, totally satisfying. An array of coffees completed our very fine meal. The House Restaurant, Tapas and Wine Bar, 199 Moonmuang Road, T. Sriphum, A. Muang, Chiang Mai 50200. Telephone 053-419-011, Fax 053-419-010, Email: the [email protected] co.th. Open daily at 5 p.m. Reservations recommended, especially for special occasions. Parking inside the gate.